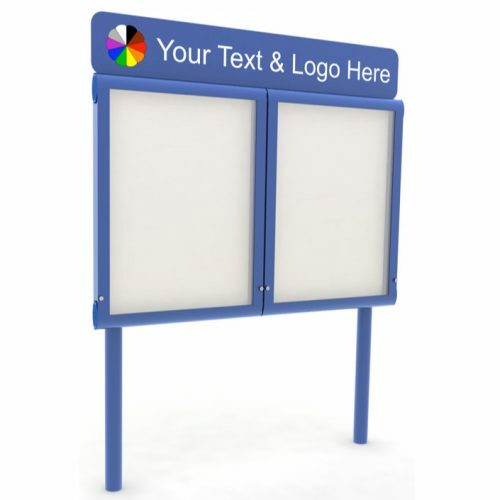 Ideal for advertising your events or displaying notices. 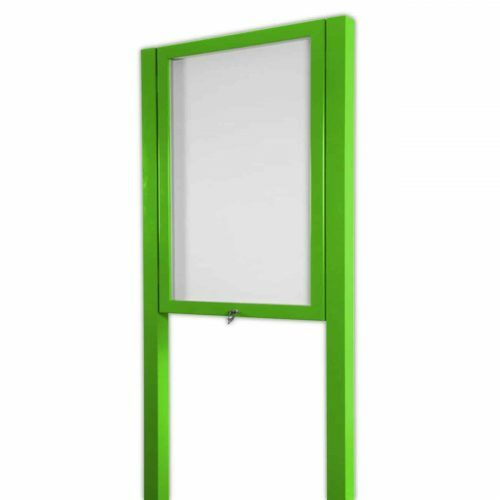 Using lockable display cabinets and aluminium panels, these notice boards are very strong and give a very professional look. 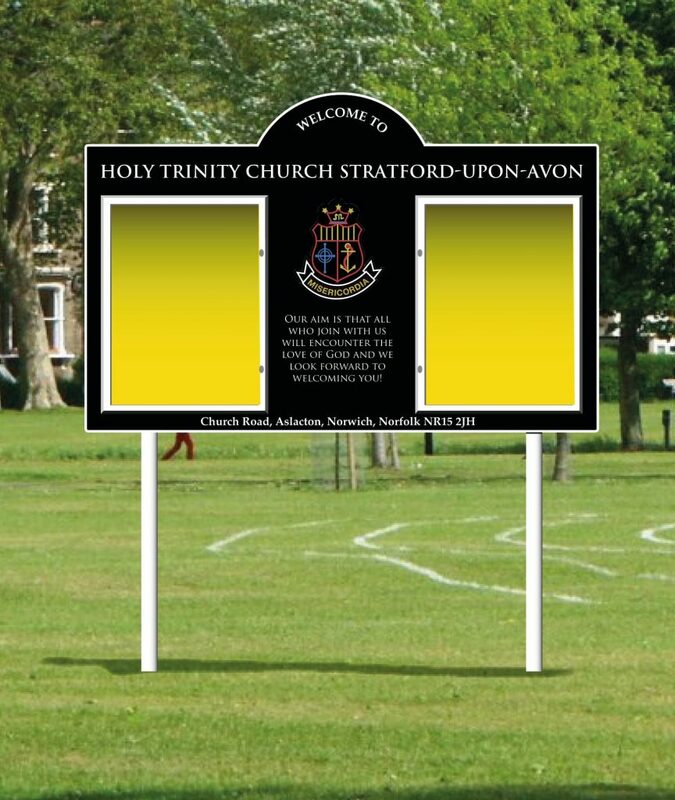 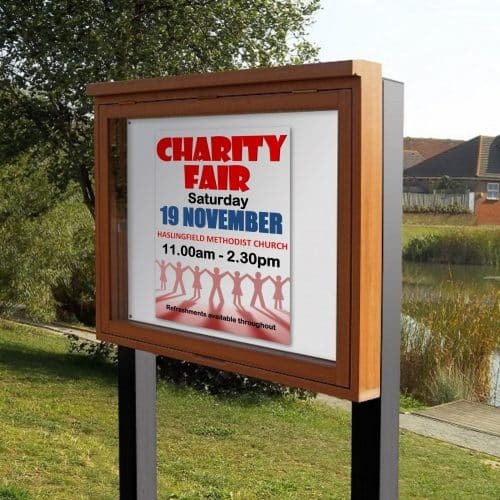 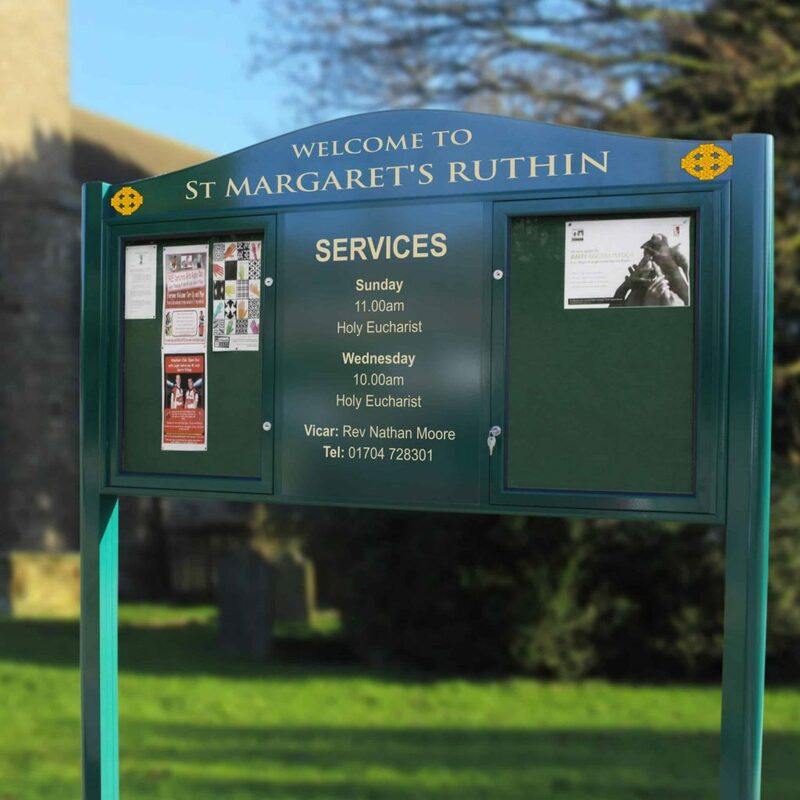 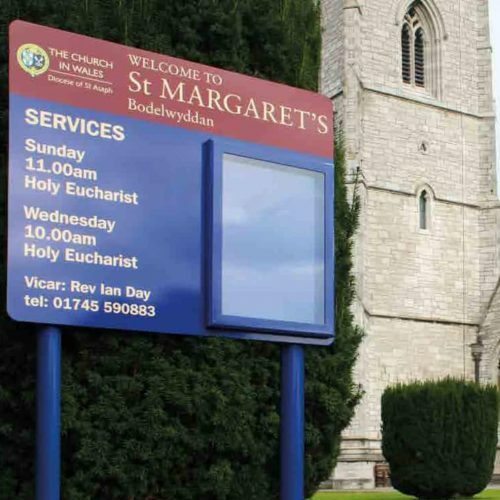 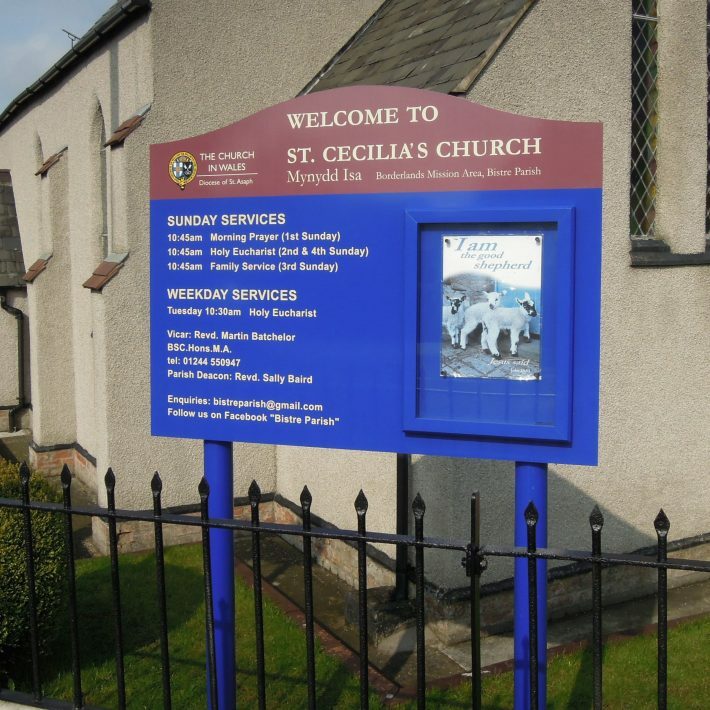 The noticeboards can be manufactured to your colours incorporating your logos and text styles. 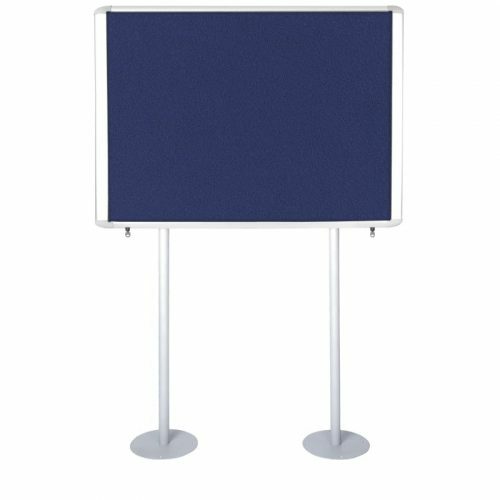 These are ideal alternatives to our premium noticeboards and are ideal for lower budgets or if you need something in a hurry. 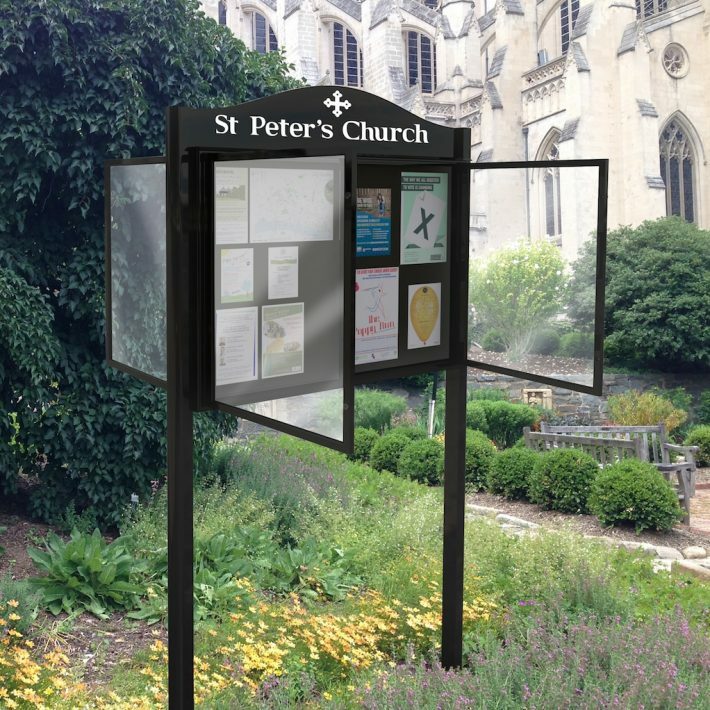 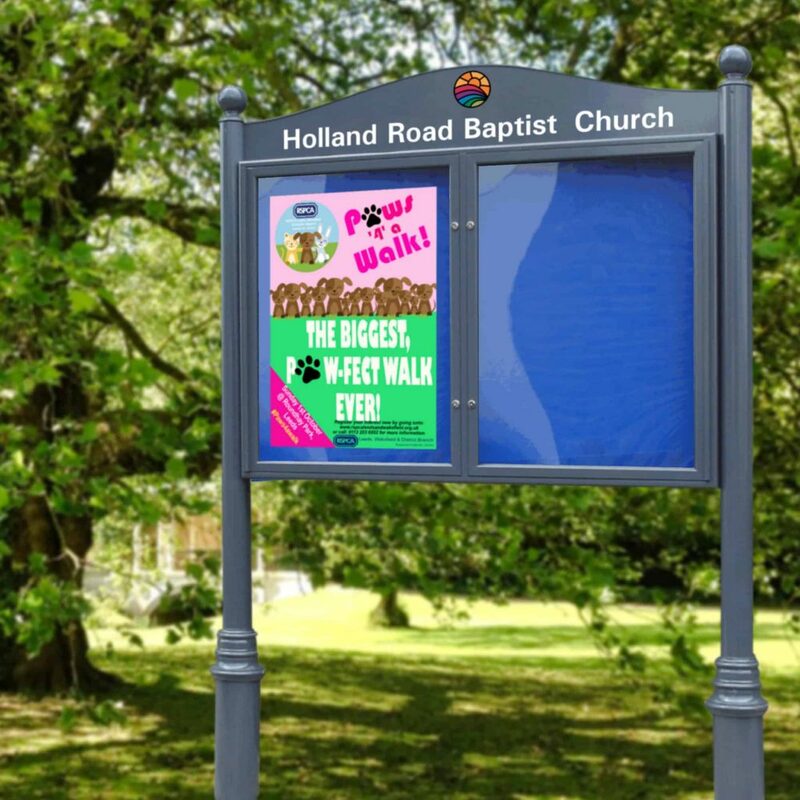 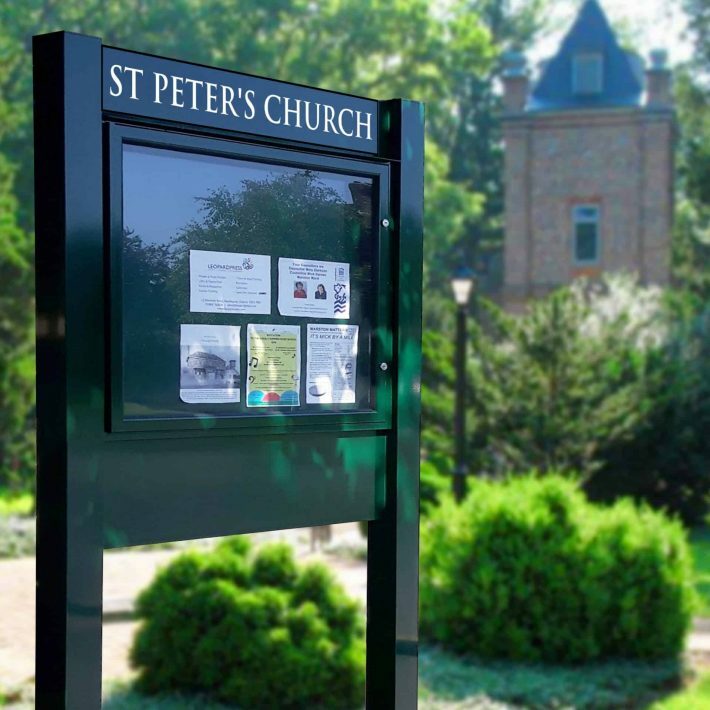 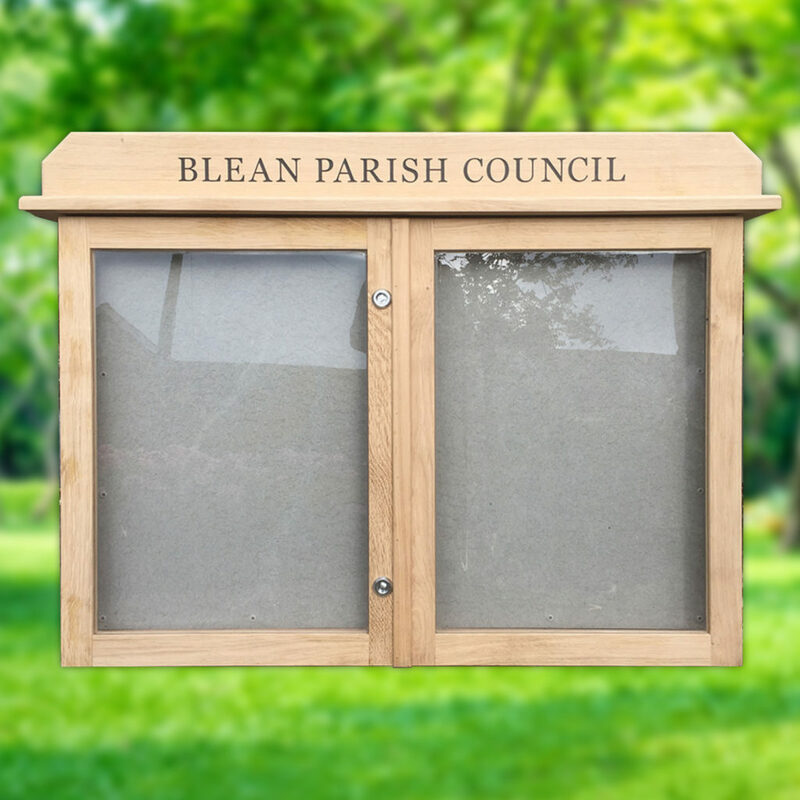 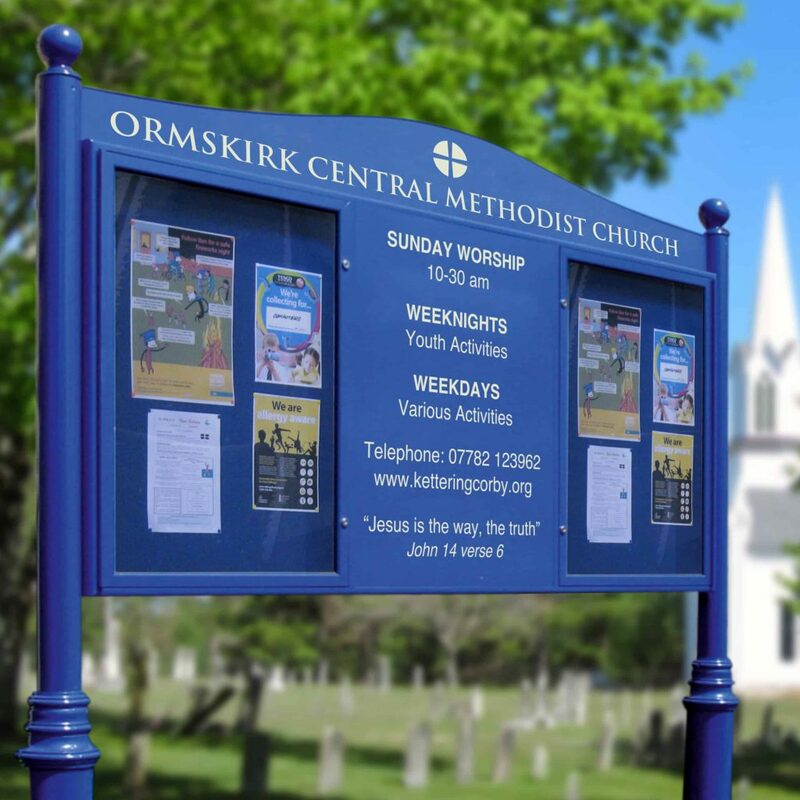 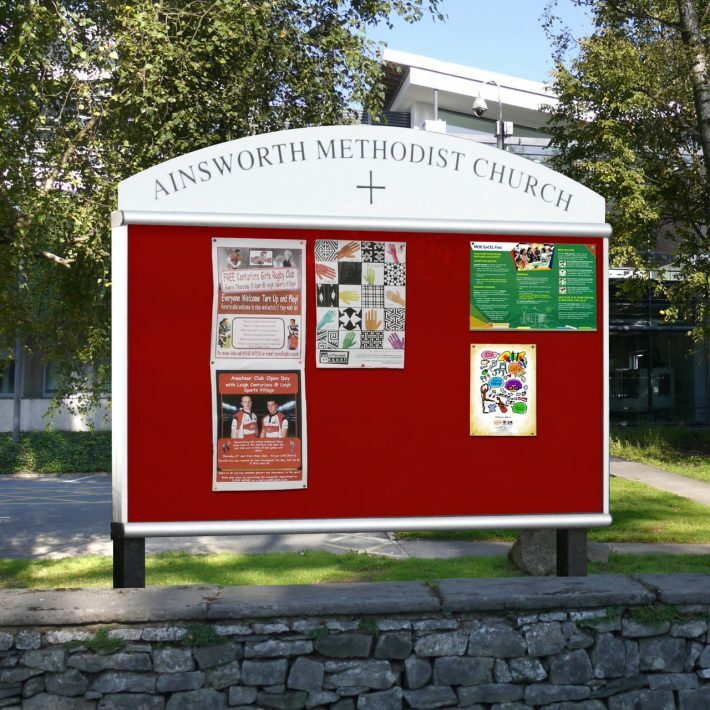 Our hand made lockable oak noticeboards are perfect for Parish Councils, churches and schools. 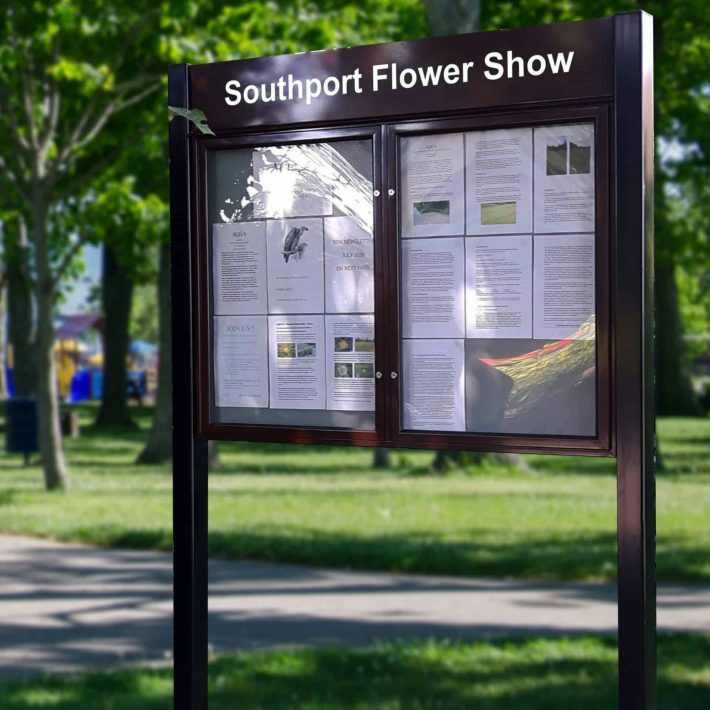 These wooden outdoor noticeboards are made from only the finest sustainably sourced, air-dried oak. 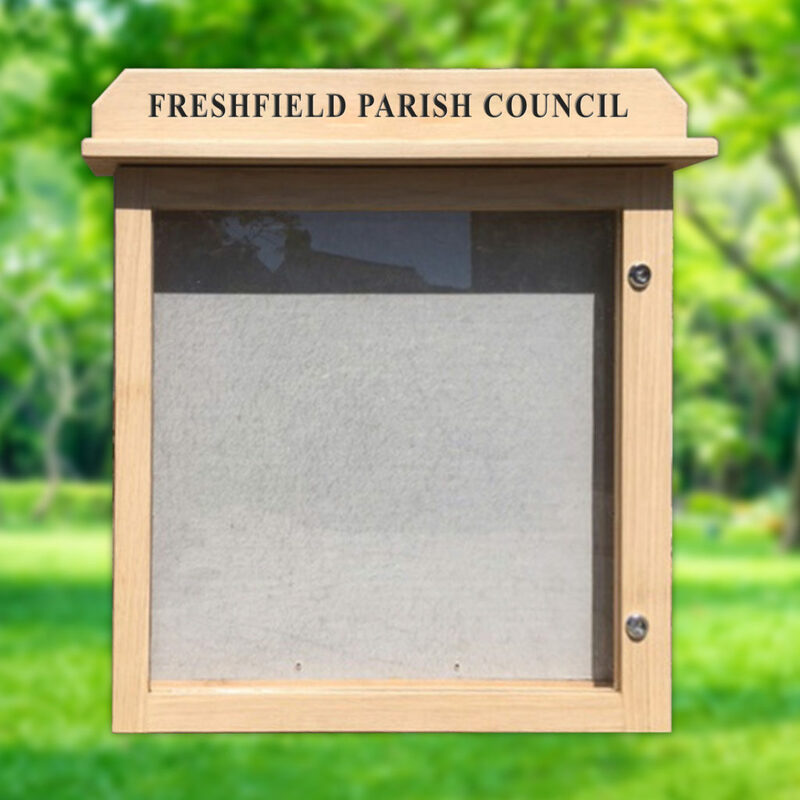 You can either choose to leave your wood noticeboard untreated and it will weather slowly to a silvery grey, or we can varnish it for you. 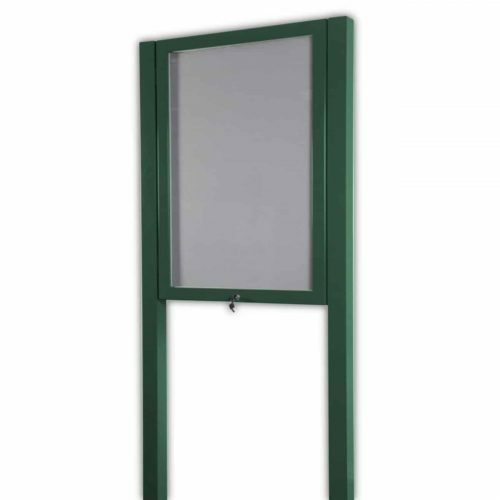 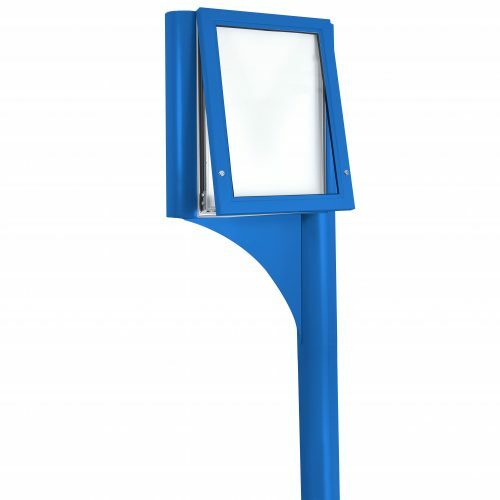 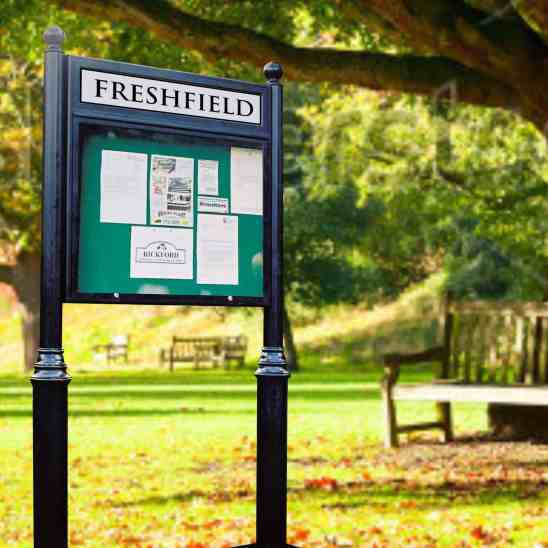 Our most prestigious notice board, Lynester offers the same highly robust protection as Varicase, but with some extra benefits including: optional ornate posts, post finials, double- sided versions and backlit box headers. 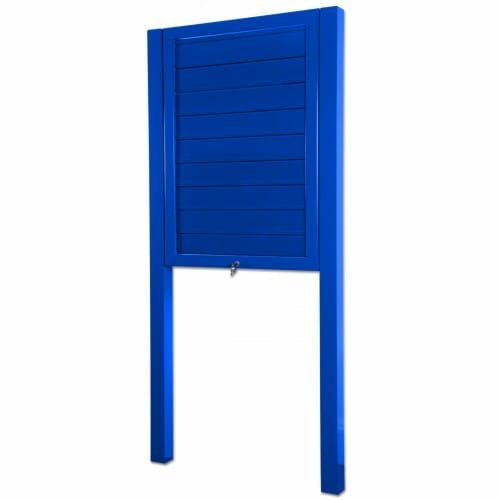 Lynester profiles have a slightly radius edges for a classic or modern look. 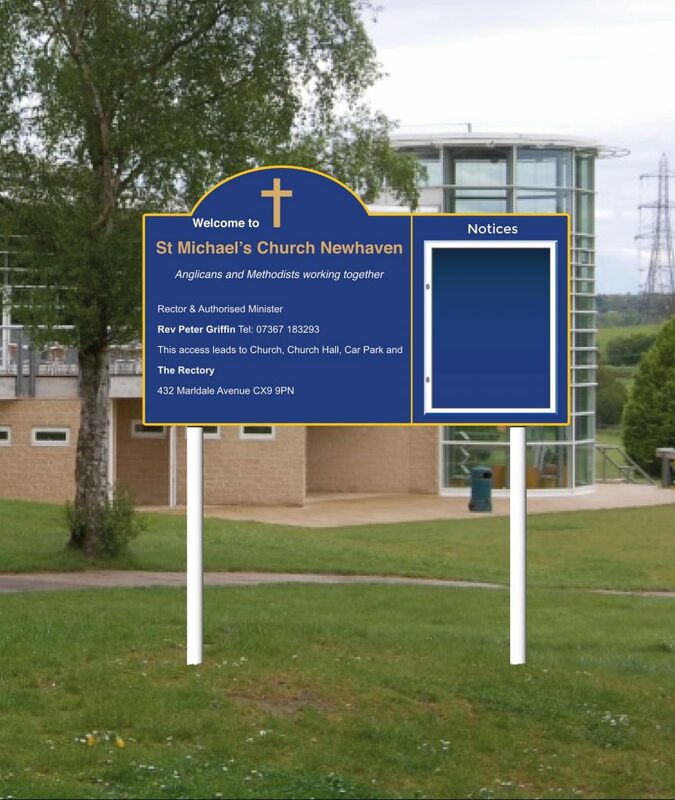 The middle panel can be updated by replacing the vinyl lettering or simply adding a whole new panel. 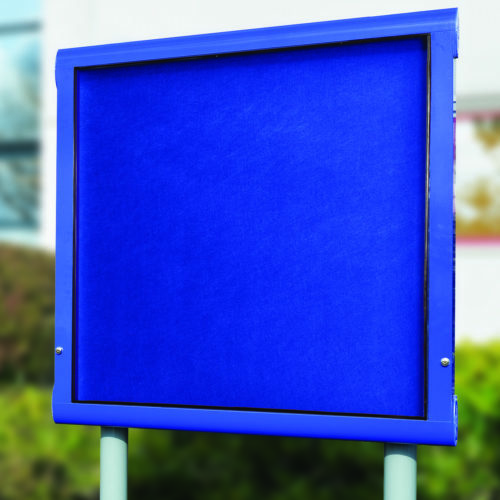 Varicase is a premium, highly robust notice board. 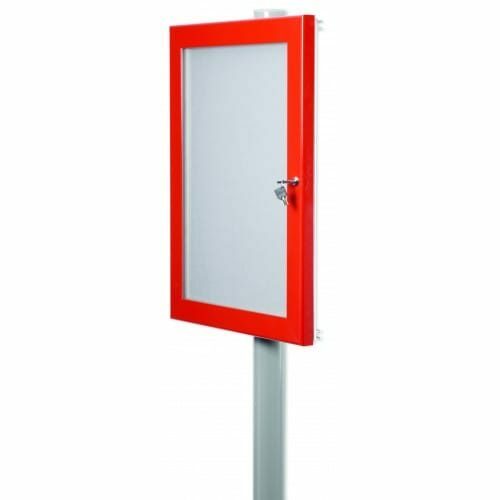 Recently upgraded to include continuous hinges and superior weather resistance. 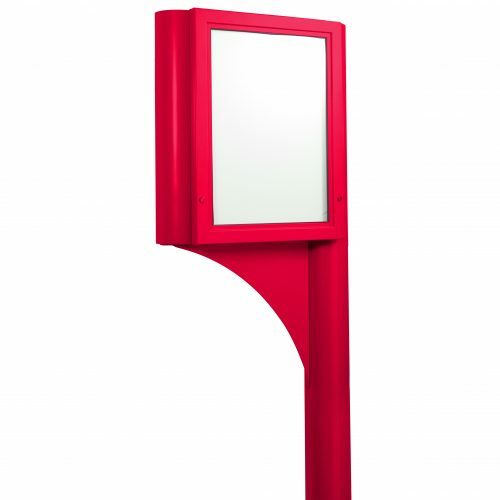 The square edged profiles offer a clean, traditional look. 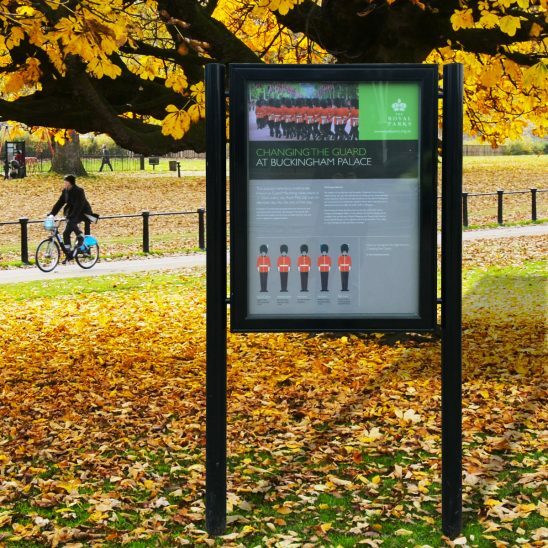 What do St Pauls Cathedral, Hyde Park, Grenwich Park and The London Library all have in common? 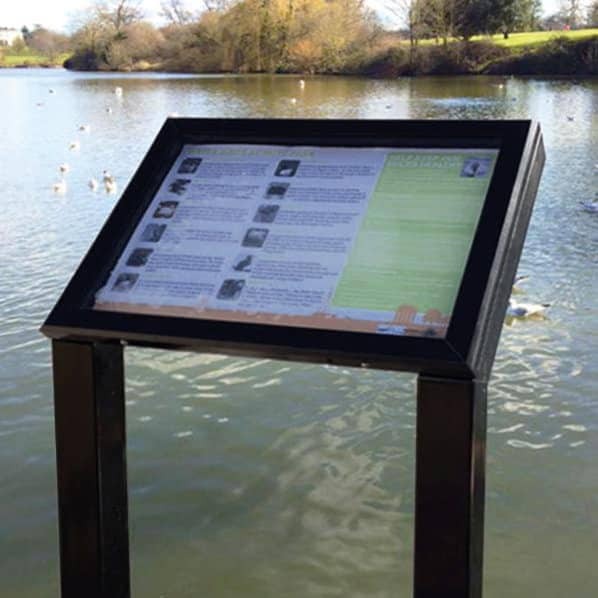 They have chosen The Tempest Noticeboard to display their information. 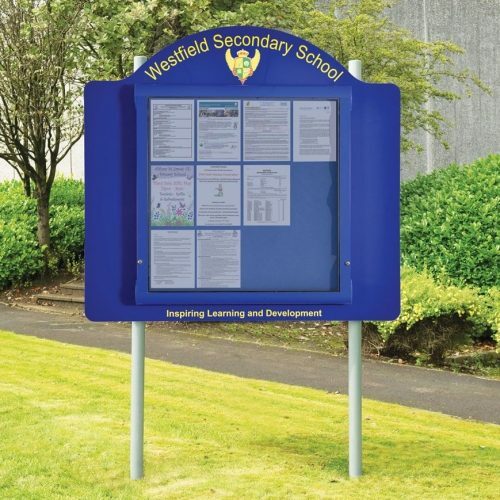 As one of our most prestige noticeboards, The Tempest is an investment to last for a long long time. 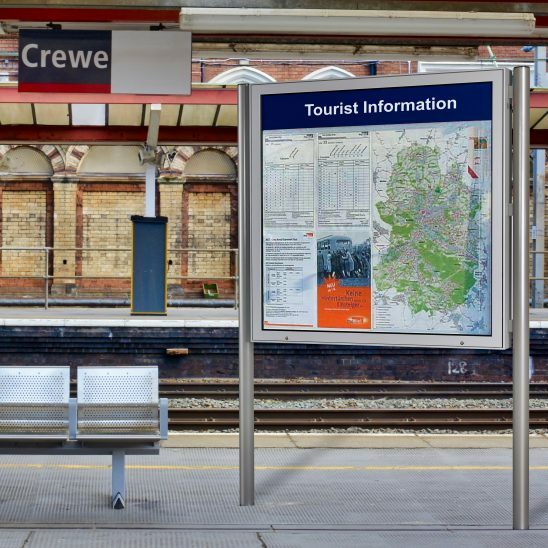 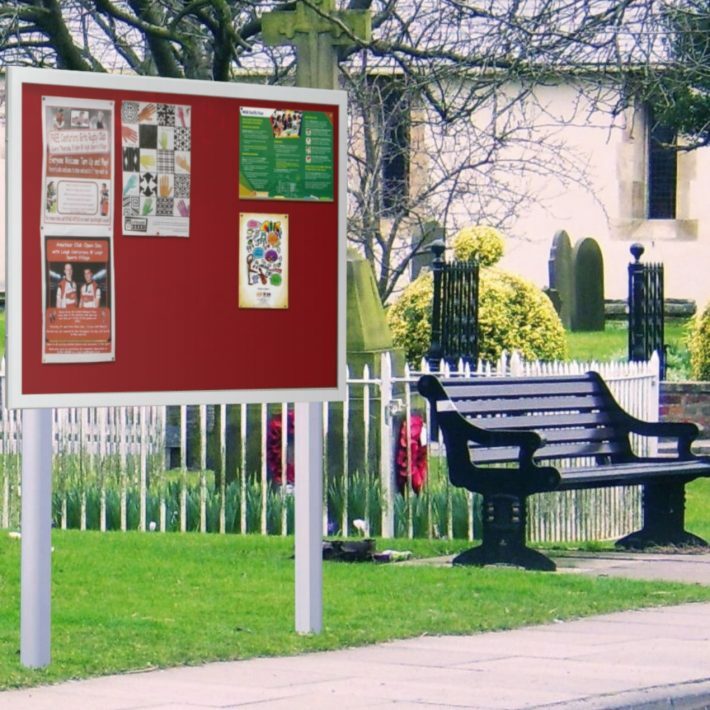 Scroll Noticeboards are a strong and durable contemporary notice board with curved top and bottom profiles. 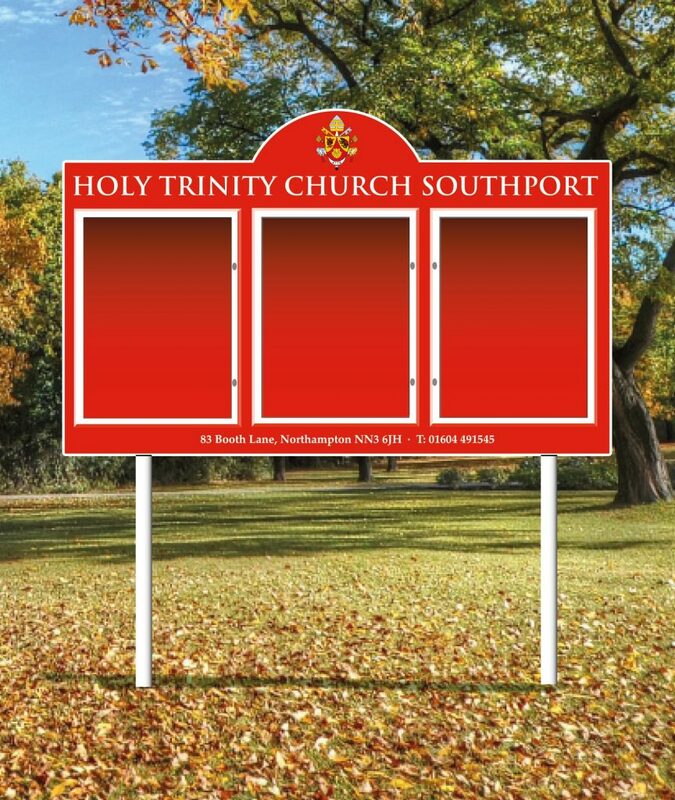 Scroll Noticeboards also offers prestigious Polished Gold and Silver frames. 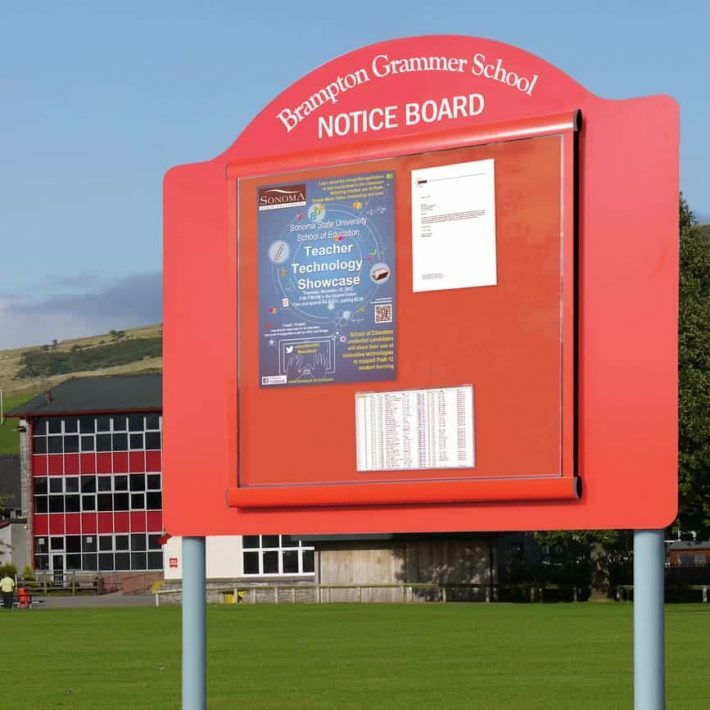 Our most prestigious notice board, Lynester offers the same highly robust protection as Varicase, but with some extra bene ts including: ornate posts, post finials, double- sided versions and backlit box headers. 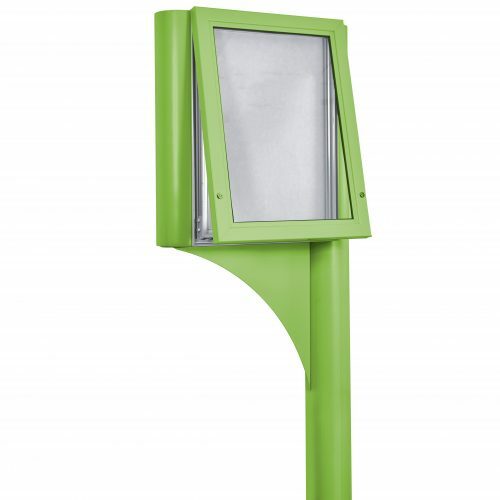 Lynester profiles have a slightly radius edges for a classic or modern look. 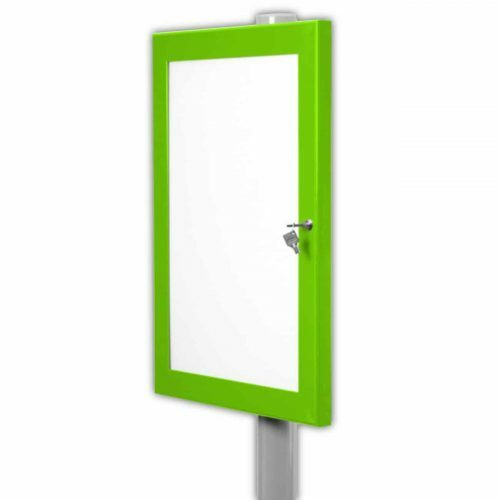 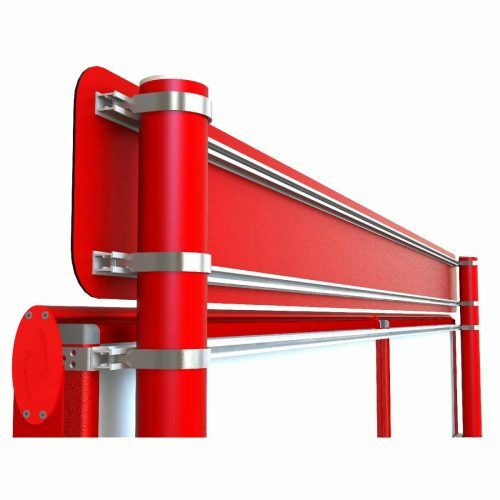 The Stormguard range offers a robust yet highly affordable method of poster display. 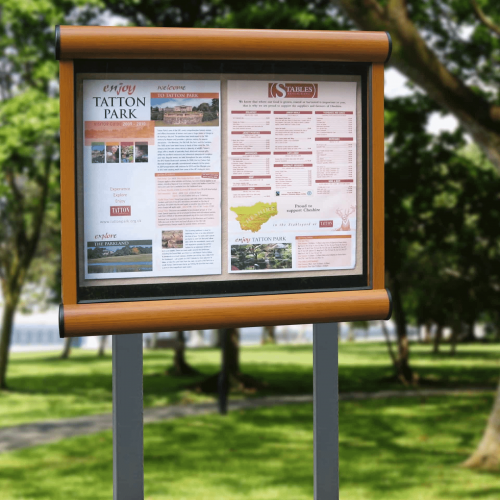 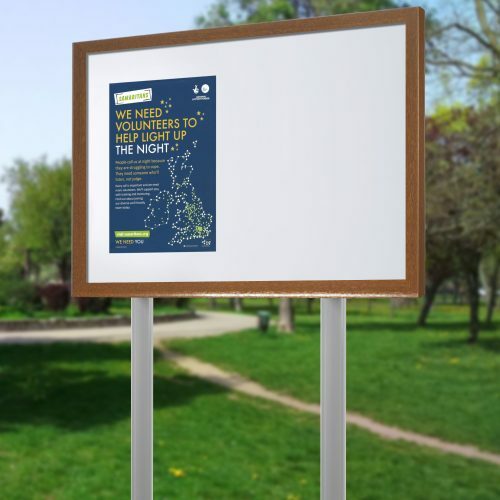 It can also operate as a notice board displaying multiple posters.